I’ve been talking a lot about thorn magick this summer within the Lunar Apothecary, in my readings, and within community conversations. The summer of 2016 has been rough. In the United States we are wrestling with ourselves, searching for our center, and coming undone. The work of repairing the world is hard stuff and it takes more than a little bit of vulnerability and grit. There are those who are learning about privilege for the first time and grappling with that heavy knowledge. There are folks who are realizing that they have too long normalized or denied or hidden the pain of the violence they face on the daily. There is a lot of opening up and difficult realizations occurring and there are a million hearts breaking in the process. To do this work of unraveling, we need to be able to feel vulnerable in ways that allow us to still feel supported. Thorn magick can play a powerful role during times like these when we are opening up, whether for the first time or all over again for the hundredth. So, what is thorn magick? It is herbal remedies that open us up while establishing a steady and protective boundary so that we can do the work that needs doing. Thorn magick allows for vulnerability and support to exist simultaneously instead of feeling vulnerable and too far exposed. I recommend thorn magick to those who are doing the hard work of creating change in their communities and in their lives; who are recovering from a difficult breakup and looking to be vulnerable in love again; to those who are experiencing difficult emotions that they have long denied but are now finally coming to the surface. Working with herbs that possess strong thorn energy, such as Hawthorn (Crataegus monogyna) and Rose (Rosa spp. ), can be as easy as preparing and ingesting a tea or tincture or the plant. Especially if that tea or tincture is made, in part, from the thorns of the plant. Adding a single thorn to your Rose tincture can powerfully shift the brew to being not only a heart-opener but a heart-protector. Sitting and communing with living thorny plants can be another way of working with thorn magick. If neither or those two options are available, even meditating on an image of a thorny plant (such as placing a picture of a sacred Hawthorn tree on your altar) can do a lot of good. However, you work with the plant, I encourage you to visualize two things occurring at once. First, see a beautiful and protective shield of thorns encompassing your whole body. The thorns are turned outward from you allowing only that which of benefit to you to get to you. Second, within this protective space, visualize your heart blossoming open like a flower, knowing that it is supported and guarded within the sanctity of your thorn space. I encourage you to move slow with the second part of the meditation - don’t force movement, but allow the unfolding of your heart to occur at an easy and kind pace. It can take time for our hearts to feel safe enough to open up again. That’s ok. Give yourself time. The plants are patient and wise and will stick with you. While there are many thorny plants in the world, I have profiled Hawthorn (Crataegus monogyna) and Rose (Rosa spp.) below which are two common and well-loved plants within Traditional Western Herbalism. I’ve listed some of the more prominent medicinal uses of each plant, but have primarily focused on their emotional and magickal gifts. Other thorny plants you might consider working with include Agave (Agave americana), Blackthorn (Prunus spinosa), Raspberry (Rubus idaeus), Bougainvillea (Bougainvillea spp. ), a great variety of cacti, and many other plants. Hawthorn is one of the first herbs many Traditional Western Herbalists turn to for supporting cardiovascular health. The herb nourishes and feeds the heart working best as a long-term tonic (i.e. multiple months of use if not longer). In other words, Hawthorn is a cardiac tophorestorative which is a restorative tonic for the heart, bringing the hard working muscle back into balance whether from an illness, stress, or the affects of aging. Hawthorn is a powerful but gentle herb meaning that children, seniors, and all between can benefit from its use. Part of Hawthorn’s heart healing gifts is its possession of antioxidants which prevent and reverse damage caused by free radicals as well as reducing oxidative stress on the capillary walls and improving circulatory tone (whether by relaxing or strengthening). The herb should be considered when there is a case of congestive heart failure, angina, irregular heartbeat, hardening of the arteries, enlargement of the heart from excessive exercise or overwork, hypertension, both low and high blood pressure, and too much cholesterol. Hawthorn shares a common characteristic found in many TWH heart herbs - it possesses beautiful flowers and protective thorns. Hawthorn helps the heart to open to new possibilities, especially after a period of heartbreak and distress such as after the loss of a loved one whether through death or a break-up. The herb protects our emotional vulnerability with its thorns. In fact, we are able to feel more vulnerable in a way that is healing and restorative when we feel protected by plant allies such as Hawthorn. Add a thorn from the plant to your tincture or glycerite preparations for extra protective energies. I have used Hawthorn many times in my practice for those recovering from heartbreak and have seen beautiful transformations occur with this plant’s amazing healing gifts. I love the language used by Judith Berger to describe Hawthorn: “As guardian of the hinge, hawthorn wisely discerns the right timing for the wounded heart to open” (Herbal Rituals, 134). Combine with Yarrow (Achillea millefolium) to help the Wounded Warrior, Wounded Healer type recover after a long period of giving and overwork where they has exhausted their mental, physical, and emotional resources. Hawthorn is also a good herb for those who feel wild and overstimulated in their grief and heartbreak. It calms, it soothes, and it protects, which is what we need more than ever when we feel raw. My favorite way to use Hawthorn as a daily tonic is as a glycerite that combines the leaf, flower, and berry. Within an astroherbology context, Hawthorn is most often connected with the planet Mars due to its thorns. Other planetary correspondences include the Sun, because of Hawthorn's affect on the heart and overall vitality of the body, and Saturn since Hawthorn is hedgeherb and boundary-marker with strong connections to the otherworld. The brokenhearted and grieving have a special place in the Hawthorn circle, for Hawthorn opens the heart after a period of despair. It is an ally for those who feel the grief of the world most readily, even if a personal tragedy is not currently present in their life. They recognize the tragedy of living on a planet that we pollute without regard to our shared sacredness and amongst endless wars and conflicts. Feeling wild in grief is a sign that Hawthorn may be needed and for some their journey with Hawthorn will be significant but relatively brief as they are able to move on with their lives with a newly opened heart. Those who need Hawthorn in the long-run tend towardsrestlessness and irritability, they are easily overstimulated and can sometimes lean (or fully reside) in the domain of the Type A personality. Often they are categorized as having attention disorders as children, whether or not this is warranted. They are children who appear to be more like changelings than a fully humyn child. Sometimes they are punished for the everyday acts of being an energetic child and disdained for their enthusiasm - they close up their heart to protect it from the hostility of a world that would prefer they sit quietly at a desk for hours following directions. Hawthorn re-opens the heart and helps folks connect with their resiliency, their capacity to forgive those who have harmed them, and to remain protected as they begin to express themselves and all their energy with pride and focus. The herb will bring calm to what has felt like a tumultuous existence, helping folks to find the tools they need to express themselves honestly and beautifully. Rose is an ancient plant with fossils have been found across Europe, North America, and Asia dating back from as early as the Miocene period (7 - 26 million years ago). The flower has been used medicinally for thousand of years, with Dioscorides recording Rose as a cooling and contracting medicine. The three varieties of Rose most often used for medicine-making is Rosa gallica (also known as as Provins or Apothecaries rose), Rosa damascena (or Rosa x damascena to denote its hybridity, also known as damask rose), and Rosa centifolia (also known as Provence Rose). More modern uses within TWH includes Rosa canina and Rosa rugosa. Roses strengthen the heart. 18th century herbalist J. Quincy wrote that Rose “raises the spirits and gives sudden strength and cheerfulness” and categorized Rose as primarily a cardiac and cephalic (relating to the head). The herb assists with memory and promotes clarity of mind, heart, and spirit by connecting all three. Rose nourishes the body and is sweet medicine which calms the nervous system. Within Ayurveda, Rose is considered a rasayana (rejuvenative tonic) and medhya (brain tonic and nervine) for all of the doshas or body types. As a plant of Venus, Rose is a classic aphrodisiac. Rose is an opener - it opens the heart and body to sensual experience. Like many aphrodisiacs, Rose has nervine and nourishing qualities which help to relax and soothe the body so that it may become ready and desirous of intimacy. Venusian magick, though, reveals desire on more than the physical level. It reveals the desire to engage mystery where there has only been the acknowledgement of the mundane. Rose is especially useful for those who have lost their spark of desire. They might have trouble sleeping, restless and exhausted, but not enough energy to go out into the world. The desire to create and experience is low along with their vitality. What they think they should be doing dominates their thoughts more than what they want to be doing. Sometimes they are not even sure they know what they want to be doing. There can be a disconnect in relationships and not necessarily a feeling of isolation, but of distance. Rose folks often experience sudden overwhelming feelings of despair and being lost without a light in the murk. Sometimes, unresolved anger simmers deep below the surface - Rose teaches us how to use both our thorns and petals to set up boundaries and supportive spaces to express how we really feel. Rose reconnects to wildness, fierceness, and determined desire. To dream and want and feel and growl and move and connect with each other. One thing that I have seen again and again that is particularly powerful about Rose, is its ability connects us back to the secret excitement of mystery. So much of our unresolved and stagnant pain arises from a false notion that we know it all or at least know that our pain is permanent, what caused it is unchanging, and that this is all that will ever be. Rose reminds us that we, in fact, know very little, acceptance of which opens the path of possibility faster than a heart that has forgotten the importance of mystery will ever achieve. Whether or not you use thorn magick and medicine in your practice, I hope that you have a space that you feel protected and held so that you are able to be vulnerable, soft, and open to the wisdom of your heart. Do you use thorn magick in your practice? What is your favorite thorny plant to work with? Share your stories in the comments below! We respect your privacy and will not share your information with anyone because we honor your thorns. Thank you for signing up for Magick Mail! The digital owls have been dispatched. Once you have confirmed your subscription to the list you will gain access to our super secret member's only area! I really do love the dark of the year. Perhaps it is the winter fog rolling in from the shoreline. Or the quiet that snowfall can bring. Maybe it is because this is the time of year where getting introspective can feel so right. A time when lighting candles and pouring tea takes on a special glimmer. And sometimes winter is hard. It is cold and dark and your car has become frozen in a block of ice. There are familial obligations that can be awkward at best and sometimes treacherous. We can get caught up in the flurry of doing as the seasons transition. For me, this winter holds a certain bittersweet sadness. I lost my beloved Grandpa earlier this year and not only will we be marking the first birthday of his without him, but all of our winter holiday-making will be somehow less bright. Which is ok. We have periods of sorrow in our lives which need as much space and care as those moments of profound joy. I have written about herbs for grief, heartache, and tragedyand these are herbs that remain close allies to me and my loved ones in this time of figuring out what we do with the spaces left behind by those who have been there for so very long. Still, though, I really do love winter and the herbs I turn to again and again during the dark year. 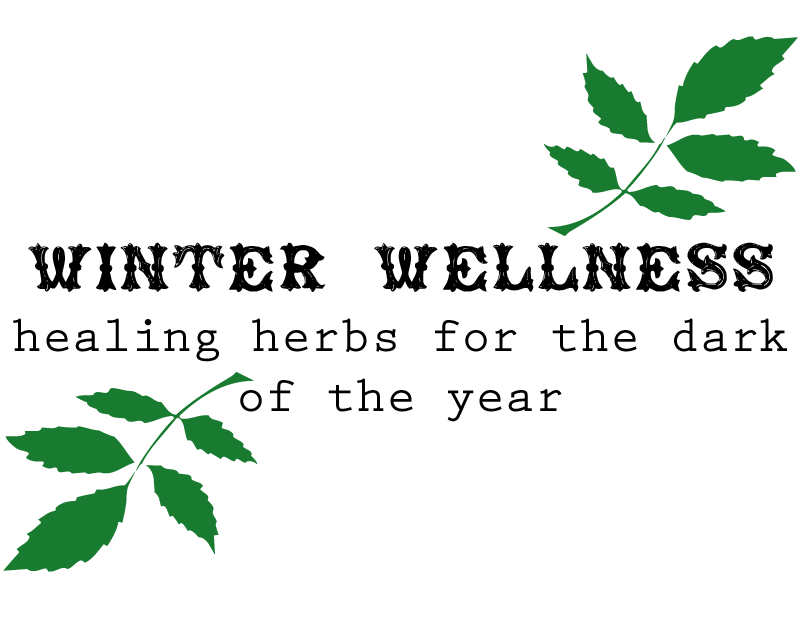 I have written about herbs for the Winter Solstice as well as recipes but I wanted to add to my list of winter-time herbs since there are so many excellent ones to choose from. Because that's what we fill those spaces with and those long winter nights - the love of steadfast companions, the joy of our wellness, and the curiosity of creatures wanting to learn more about our extraordinary planet we call home. Because my Grandpa, a Marine who wore holiday teddy-bear sweaters with puffy paint, who was gruff and grumpy, who could read your story in a handshake, and who loved wolves (the animal), jaguars (the car), and Star Trek (the best), would be asking for his "herbal drops" whether or not I was feeling winter joys or winter blues. Thanks, Grandpa, for keeping it all in big, wild, heart-centered perspective. The following are some of my favorite herbs for the winter. If you're looking for further astroherbology or medical astrology perspectives on herbs for the winter and the Winter Solstice, check out The Longest Night: Herbs for the Winter Solstice Season. I've also posted some recipes for winter at Winter Solstice: Recipes for Mirth + Brightness. And if you're still thinking, heck I would love even more inspiration and recipes for the Winter Solstice, especially if it involves recipes inspired by Krampus and blends of great merriment, then check out The Winter Apothecary: Joyful Recipes for the Dark of the Year. Uses: The list is long but includes alterative, anti-inflammatory, antiviral, digestive, expectorant, rejuvenative, vulnerary. Contraindications: Excess fresh berries can have a laxative effect. While Sambucus nigra is generally safe, other varieties of Sambucus are poisonous, so properly identify before using. Elder is a delicious winter remedy. I use the berries and flowers in my Cauldron Polish Cold Care Elixir and the flowers make an incredibly delicious glycerite. The herb has a big reputation as an amazing healer and the Elder Mother lives up to her reputation. Elder is effective in bringing relief when winter colds and the 'flu has come to visit, as the plant is powerfully antiviral. The berries and flowers are diaphoretic and diuretic which means they help us to release toxins and as an alterative they assist the body in returning to homeostasis. Elder is drying, too, without being too warming. The flowers, taken internally as an alcohol extract or glycerite, are especially useful in cases of ear infection. British herbalist, Andrew Chevallier, recommends Elder flower combined with Wood Betony (Stachys officinalis) for headaches that come about because of the cold or a chill. If you are brave (or foolish) enough to sit under an Elder Tree on an important night of the year (namely, Midsummer and Samhain), you just might see the Good Folk march by in all of their finery. The spirit of the Elder is a gatekeeper between the realms of life and death - she is fiercely protective and very no-nonsense. Burning Elder wood is considered very unlucky but it can be worn as an amulet for protection (especially against lightening which apparently was something to be really worried about back in the days when these charms were being written down in old grimoires and herbals). The herb planted in front of the home or used in charms keeps away harmful and unkind spirits. I think Elder is really useful as a preventative tonic - it is such an appealing flavor that it can be added to teas, made into syrups and electuaries, and made into a simple jam. I don't think I've ever used Elder as an alcohol extract because it is such a pleasure to use otherwise, but if you do prefer alcohol extracts, standard dosages apply. Remember, a dose of Elder a day keeps disgruntled yetis away. Fok names include: Lammint and Brandy Mint. Uses: Analgesic, analstetic, anti-inflammatory, antispasmodic, carminative, digestive, emmenagogue, expectorant, vasodilator. Contraindications: Avoid during acute gallstone attack. Soothing but enlivening, I really enjoy a good cup of mint tea any time of the day. The scent, taste, and healing qualities clears the head, clearing the cobwebs from the corners of our minds. I use peppermint most often in digestive blends when the stomach is cramping (combine with Fennel (Foeniculum officinale) for a simple and sweet tasting digestive tea). Peppermint is also useful in cases of nausea, gas, and general indigestion. Additionally, I use it quite often in cold and 'flu blends for its antiviral, clearing, and calming qualities. Combine with Elecampane to assist in clearing up unproductive and phlegm-y coughs. Deb Soule recommends preparing a hot tea of Peppermint combined with Yarrow (Achillea millefolium), Elder Flowers, and Catnip as an old-time and effective remedy for bringing down fever. Topically, Peppermint is soothing to sore muscles as a compress and can also be used in steams to clear sinuses, ease asthma, and to ground a shocked system. It makes a great addition to all natural and mouth washing blends as well as in toothpaste powder blends. Use a cool compress for rashes and hives, to bring relief to the feverish, and to smell really nice. Peppermint is used in all sorts of ways in magickal work from blends to induce visions to love spells and healing charms. I like Peppermint in money and abundance charms - the herb grows abundant and once it takes root it is there for good - definitely a good quality when it comes to prosperity! The plant is guarded by Mercury which makes sense given its use for both enlivening and soothing the senses as well as clearing stagnation. I also place Peppermint under the guardianship of Moon not just because of its digestive-emotive qualities, but it's cool, fresh taste is silvery and quick. I think tea is the most pleasant way to enjoy Peppermint. Fresh mint and honey makes a delicious syrup, so you should probably do that, too. Alcohol extracts are standard dosage if you prefer such a route. Folk names include: Elfwort, Horse Heal, Wild Sunflower, Scabwort, Velvet Dock. Uses: Expectorant, digestive, diaphoretic, carminative, mood enhancer. Contraindications: Do not take if pregnant or breastfeeding. Do not use externally if there is history of allergic contact dermatitis. The yellow flowered Elfwort is primarily used as a warming lung tonic and it is an excellent winter ally when bronchial complaints of the damp variety are around. I'll admit that I was first attracted to learning more about Elecampane because it had a common name of Elfwort and an association with Witches. It has since become a consistent ally in my Apothecary. You'll notice that the Latin binomial includes helenium which has been said to be linked to Helen of Troy, the yellow flowers supposedly represent her tears. So, we have a plant that is a lung tonic and possesses a story of tears. It is good to know then, that the lungs are energetically the seat of sorrow and grief. Sometimes, when sorrow or grief is unexpressed it can transform into weakness or health imbalances in the lungs. Elecampane's myth tells us then about it's energetic and medicinal signature - it is a plant fit for damp lung complaints, but especially where sorrow and grief is present. Breathlessness, wheezing, asthma and migraines brought on by the cold, and a wet cough are all signs that Elecampane may be useful. The herb loosens phlegm and soothes irritated respiratory passages. The herb can be used both for acute complaints and as a preventative tonic. Traditionally, herbalists like Hildegard von Bingen have recommended Elecampane be prepared as a wine extract and, in general the plant is well prepared as a sweet cordial or digestive blend for before and after meals. As a digestive herb, Elecampane is useful in cases of sluggish, cold, and weak digestion, relieving gas and gently stimulating digestion. Additionally, Elecampane brightens the mood, especially of those who are given to a nervous disposition. The herb has historically been used topically for skin complaints such as acne as well as hip pain, including sciatica, and the bites of insects and snakes. Magickally, the herb is used in protection sachet against harmful energy - especially ill energy brought in by cold winds. As a wort of Elves, it protects against the more mischievous energy of our Hidden Kin, creating a shield against elf-shots and similar unpleasantries. You can also use the herb to enhance your psychic visions and to bring true love your way. Elecampane is said to be guarded by the Sun, Mercury, and/or Uranus depending, and each makes sense. The Sun not only because of Elecampane's yellow and bright flowers, but because it is warming and assists with overall heat and vitality in the body. Elecampane's Mercurial energy appears in it's drying abilities and usefulness for those who tend towards nervousness and are poorly affected by the cold, while Uranus speaks to Elecampane's ability to balance conditions of digestion, circulation, and the erratic nature of elf-shots. The root can be used in a decoction and sweetened with honey. More commonly, the alcohol extract is used (1:2 fresh or 1:6 dried) and dosage ranges. If you are using Elecampane as a tonic and preventative, I would recommend lower doses of 1 - 10 drops daily, while with chronic complaints the dosage can be increased to up to 30 - 40 drops up to 4 times daily. Personally, I recommend low drop dosages, but follow your training and body's needs. We respect your privacy and will not share your information with anyone including Krampus. Thank you for signing up for Magick Mail! The digital owls have been dispatched and will be delivering a heaping dose of magick to you soon!